Leo Tanguma, the Chicano muralist perhaps best known by Colorado travelers and the subcultural blogosphere of paranoid doomsday theorists for his dramatic murals at Denver International Airport, creates his complicated pieces through an organic, multi-step process that weaves Mexican heritage, world history, spirituality, progressive social ideals, and personal anecdotes. He made his first mural on a chalkboard in fifth grade, depicting children lynching the town’s corrupt sheriff, for which he was severely punished, and this experience stoked a rebellious verve in his artistic practice that would be played out during the coming decades. Much like Los Tres Grandes - Diego Rivera, José Clemente Orozco, and David Alfaro Siqueiros - from whom Tanguma draws his artistic heritage, he has a keen interest in politics and cultural theory, of which his views swing decidedly left. His sprawling, complicated, large-scale public artworks do contain a number of secrets: portraits of real people lost to street violence, unsung heroes from the margins of history books, and the reexamined Chicano myth of a weeping woman, for example. 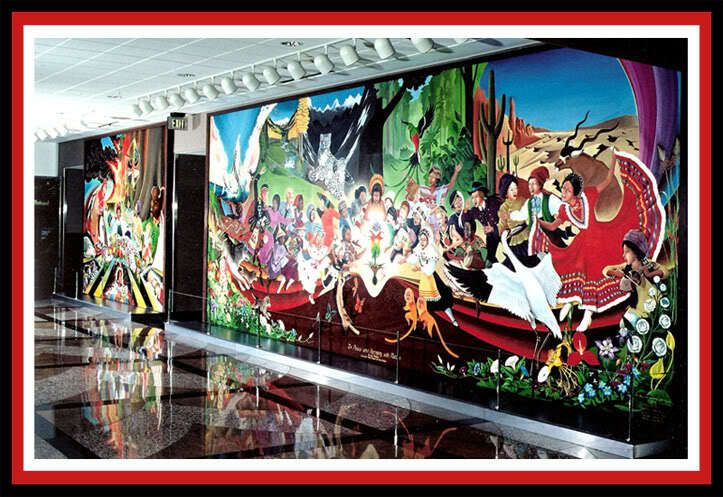 “Children of the World Dream of Peace” and “In Peace and Harmony with Nature,” the murals that Tanguma created for Level 5 of the Jeppesen Terminal at DIA, were almost never to be: Tanguma barely made the proposal submission deadline. As of this year, he has completed dozens of murals at various public venues across six states, painting themes of childhood courage and idealism, environmentalism, multiculturalism, and Tanguma’s uncanny signature of socially-conscientious spirituality. His most recent work in progress is inspired by the Occupy movement, the pencil drafting of which, sits on a modest, clean desk in his home studio. At the Denver Art Museum, a lot of kids come from the schools, the projects, from schools that have a lot of Mexican-American kids. When I tell the kids about her and say, “Do you know what La Llorona means?” they say, “Yes, we even know where she lives, there under the bridge.” She’s a really intense figure in our memory I guess. But then I tell them, “Don’t you see, somebody said that she killed her own children, but I don’t believe she did it.” Maybe she did, maybe she didn’t, but I don’t want to project that story anymore. So I tell the kids, “I have La Llorona find her children and she’ll stop crying and stop searching for them through eternity, which is what God condemned her to do.” Then I tell the kids, “They lived happily ever after. Don’t you want to live happy ever after.” And some of those kids had tears in their eyes. What happened I think was that something happened when I was growing up in Beeville, Texas, a little town fifty miles north of Corpus Christi. Like many little towns in Texas we had very racist sheriffs and police that liked to keep Mexicans in our place. In our town it was a sheriff named, Vail Eniss. One time the sheriff went to see about some minor thing between a Mexican husband and his wife about their children. The young man was not there, but the father was there. The sheriff arrived there with a semi-automatic rifle - now why if you’re only concerned about a minor incident? So he gets into an argument with the father and shoots him and as he shoots him, there’s other people that were in the yard that came around and he shoots them also. He killed three people in a few seconds. The man at the front was my mother’s uncle, Mr. Rodriguez. So in our family that was talked about. And in other families also. For example, my brother-in-law was put in jail and the sheriff personally beat him with a hose. I don’t know for how long, but severely. It was really really bad. He was just drunk, that’s why he was in jail. So we had a kind of a hate for the system because those things kept happening and the sheriff kept being exonerated over and over and over until he retired with honors. So you see, we already had a disposition, some of us, that there was something wrong here. Why were treated like this. When I was in the fifth grade, one day our teacher didn’t show up, so a lady from the office came and said we were going to have a substitute and later she would arrive and for us to stay at our seats and behave. And when the lady left everyone began to play and talk and stuff. Some kids went up to the blackboard. I was more reserved than most folks. We were a little odd. Some of us were Baptists in a community that was almost totally Catholic. So we were a little more reserved. I was sitting down for a long time and some kids were drawing already and after a little while I said, “Okay I’ll go draw too.” So I went up to the blackboard. I didn’t know what I was going to draw, but before I could draw, somebody said, “Pollo, draw me killing the sheriff.” Also all the kids began to say, “Draw me too! Draw me too!” So I started to draw the sheriff hanging or being stabbed. Then the substitute walked in. She was outraged at what she saw. Of course, when I saw her, I ran and sat down, but she had seen me already. She looked at the drawings and she said, “You, come here and erase this garbage.” I began to erase it and she got a ruler and began to hit me across the back. She was in a rage. And I began to cry. I guess I couldn’t see too well because I thought I was done erasing so I ran back to my seat and she said, “Come back here, you’re not done yet.” Because I hadn’t finished it completely. So I erased it completely. She hit me a few more times on the back. I don’t remember too much about what happened after that. Whether I went to sit back down or just stood there. For a while I stood there. What happened in my case was there were people, Los Mascarones, - masks - and they did a performance and so after the performance a lot of those kids [in Los Mascarones] stayed in my home. I had an enormous living room. After the performance they were at my house and the kids were sleeping already and I was having coffee with the director of the group and I asked the man, “Do you know anybody who could get me introduced to Siqueiros.” I was asking this guy - Mario was his name - and he said, “That’s his grandson sleeping right there.” I wanted to go wake that kid up. In the morning, I said, “Could you introduce me to your grandpa?” And he said, “Sure, just come on over.” So that’s how I met Siqueiros. Well Siqueiros was the most outspoken of them. Before the revolution began, like 1911, he was a student at the Academy of San Carlos in Mexico City. He and the other guys, he must have been 14, 15, and they were meeting already about political issues that were being discussed in Mexico before the revolution. And Siqueiros talked about this when I interviewed him. It was another awakening for me. Siqueros was so dynamic and a little reckless also. Do you remember Trotsky? Trotsky separated himself from Stalin and the rest, and Trotsky was a little more progressive I think. But Stalinists thought that he was dividing the worldwide communist movement and so they wanted him killed. Siquerios was a Stalinist in those days when he was young. When he was older he didn’t want to talk about it. He’d say, “We were young then.” He tried to assassinate Trotsky himself before Trotsky was finally assassinated. And that’s the way he was, kind of crazy and reckless and so on. Some other artists did it because the Mexican painters were revolutionary in the Marxist way. Being not very easy with words, I tried to read Marx, but it was just too complex and boring. On the other hand, the Bible was easy for me and to see it in my family and going to visit my brother in prison and seeing all those things, they were impacting me. For example I painted a mural about black and white. It was four or five feet off the ground, 18 feet higher up, and I painted many bodies, brown bodies, because we had been made to feel inferior to the whites. I remember seeing also in the 7th grade for the first time the black kids, the Mexican kids, and the white kids were all together, and I remember the black kids, when they went to speak to the teacher, and the teacher spoke to them, they lowered their heads. We were pretty bad, us, the Mexican kids. But we didn’t do that I don’t believe. We didn’t look the teachers in the eyes very much, but we didn’t lower our heads I don’t think. And I thought that was out of some humiliation and as I studied more about blacks and other oppressed peoples, I could see that what I had was an instrument in my hands that I could use to return to the people a sense of their history and their beauty and their human dignity. And people responded to that. They like those kinds of explanations.